The synopsis: Libby Day was just seven years old when her older brother massacred her family while she hid in a cupboard. Her evidence helped put him away. Ever since then she has been drifting, surviving for over 20 years on the proceeds of the ‘Libby Day fund’. But now the money is running out and Libby is desperate. When she is offered $500 to do a guest appearance, she feels she has to accept. But this is no ordinary gathering. The Kill Club is a group of true-crime obsessives who share information on notorious murders, and they think her brother Ben is innocent. Having recently read Gone Girl and loved that I was almost expecting Dark Place to be a let down but it so wasn’t. 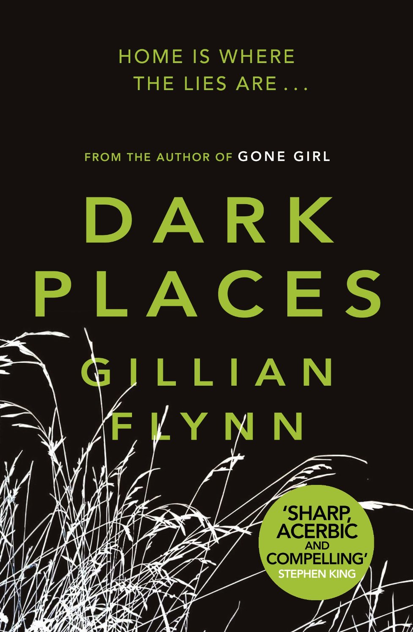 Dark Places is a fabulously gripping and engrossing tale that unfolds before your eyes like a car crash that you can’t help but watch. I didn’t guess the ending which is pretty rare these days and I found the key elements which were woven into the story to be clever rather than clumsy and annoying (like I so often do!). Gillian Flynn writes beautifully, effortlessly (well to read, it’s probably darn hard work to write) and engagingly. Her characters are alive in your mind and you care about each and you can’t help but have feelings about each and every one of them. You hate the bad guys, feel empathy with the victims and fear/sorrow/pride as required for the main stars. This is a great book and Gillian Flynn is bloody star!